Welcome to Yorkshire! Here at Celebration Holiday Homes we love Yorkshire and we want you to have the best venue for your stay. We have made sure that our cottages have the best facilities possible to create a truly memorable weekend away with your loved ones. Welcome to the truly wonderful West Acre, in the picturesque village of Wistow, close to York. Set in its own very private landscaped garden, this new build luxury holiday home with over 5,000 sq feet of internal accommodation has been designed by the owners for entertainment and relaxation. Providing you and your party with the perfect celebration getaway. When looking for luxury cottages Yorkshire look no further than West Acre. 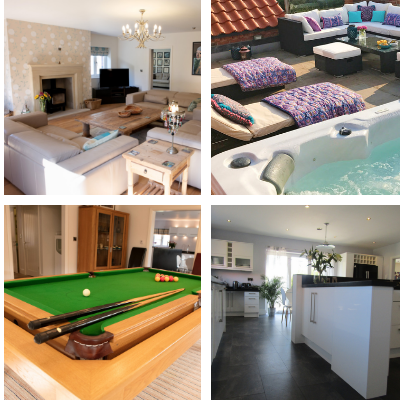 Your hosts Jeff and Vicki have made sure that this fantastic holiday home has everything you will need to relax, have fun and be social with your guests. 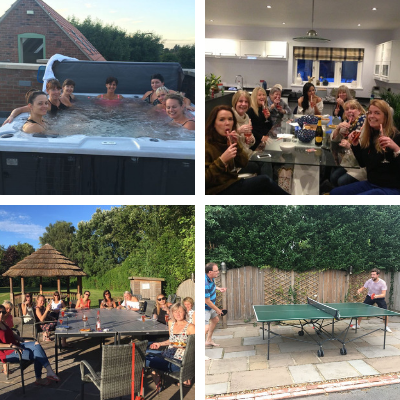 West Acre is perfect for any celebration whether its a birthday, catch up with your loved ones or a hen party you will be sure to make treasured memories. 7 Individually designed bedrooms that can sleep up to 16 guests with 7 bathrooms (one accessible bathroom). 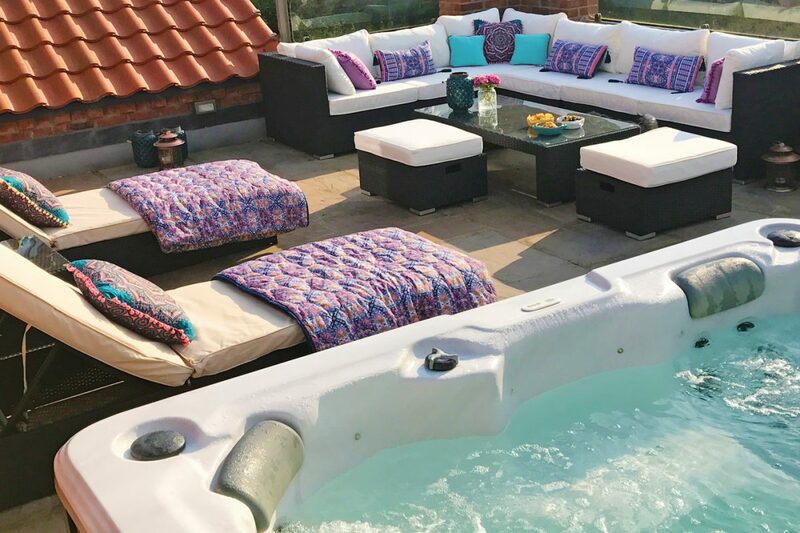 Outdoor terrace that has a hot tub, sun loungers and seating area. Host Support & Welcome - Jeff was amazing and the correspondence with Vicki was fantastic. Beautiful house. The photos on the website are fantastic but they don't show just how big the house is, it's amazing. Happy for you to use our photos. We loved playing rounders and the garden is so big there was no chance of losing the ball. Just an absolutely ideal location. Couldn't ask for any more. Vicki was at the end the phone any time - even answering a text in the evening about hairdryers. The cupboards were well stocked, and everything you could need for any occasion was provided, indoors and outdoors. It's Judith's 50th next year and we are definitely going to come back. The decor is beautiful and everything is amazing. West Acre is located in the small, secluded village of Wistow that will be the perfect place for you to relax and pamper. 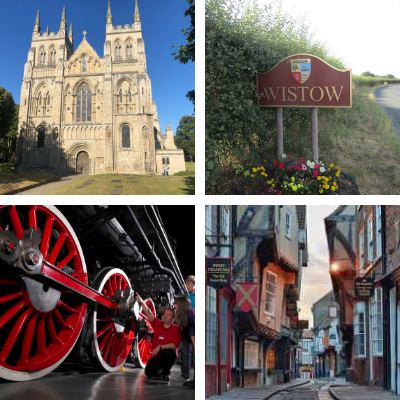 The neighboring town of Selby is home to the beautiful Selby Abbey and multiple fantastic restaurants for a group celebration meal. Just a short drive away from the cities of York and Leeds that have plenty of attractions and restaurants that all of your family and friends will enjoy. Click Here to read our blog on 11 attractions for a great family day out on York.